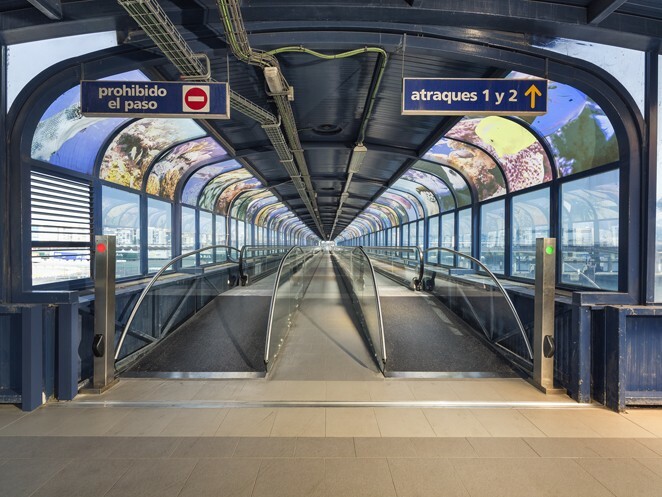 Our modular pitless moving walk system is readily configured and adapted to your specific application whatever your requirements may be. Fewer components and low energy consumption translate into reduced maintenance and operating costs. With more than 50 safety options and unique features, iwalk puts your passengers’ safety first. By revolutionising the way moving walks are designed, manufactured and installed, iwalk establishes a new industry benchmark. Its modular space-saving concept facilitates planning, integration and operation without compromising usability. 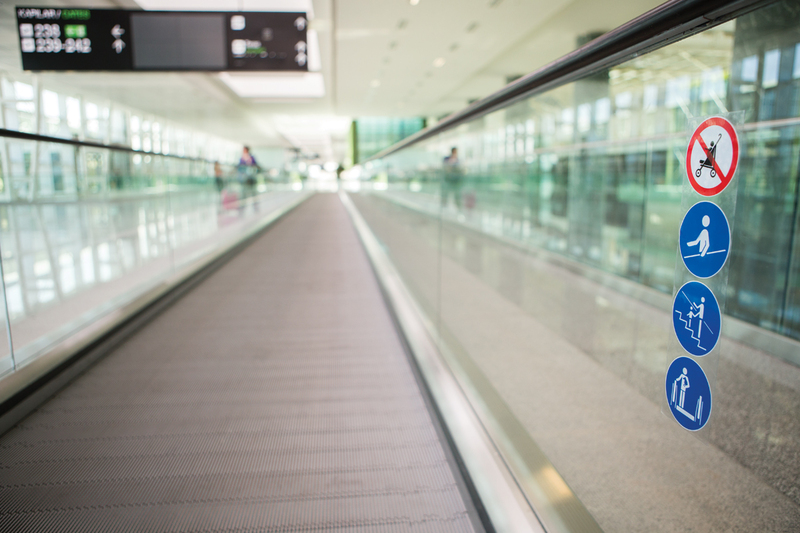 For passengers travelling with luggage and trolleys, it offers greater safety and comfort. Fewer components and low energy consumption complete this sustainable product’s ground-breaking engineering. iwalk. 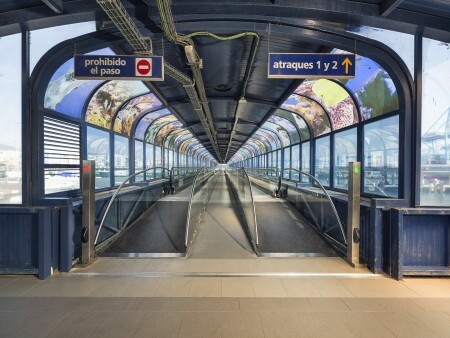 The next-generation moving walk today. 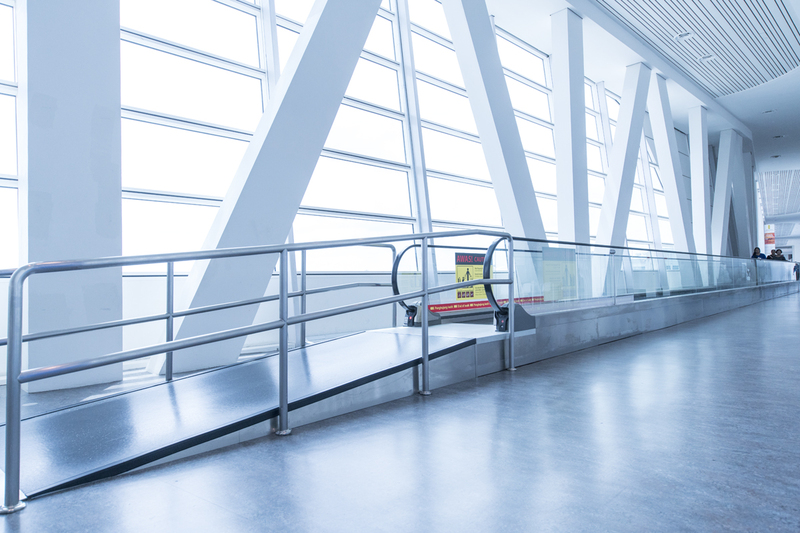 iwalk features standardised modules that are easily exchanged or replaced, making last minute changes a simple matter. 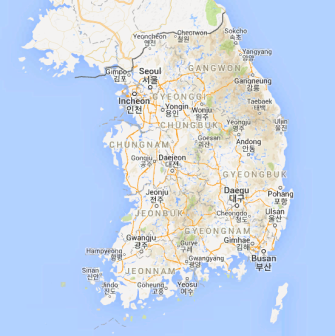 Now even relocations are possible using just a forklift. Compared to conventional designs, iwalk’s reduced outer dimensions and 30% lighter weight put less strain on your building, which means less reinforcement in the architecture. 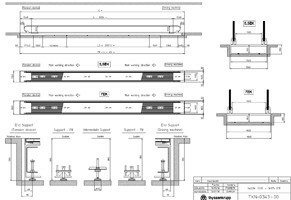 Choose between two configurations: one with a reduced pit depth or a pitless version that you can place directly on your finished floor. The benefits are yours, from minimal to no extra civil work, making iwalk ideal for any modernisation or replacement project. 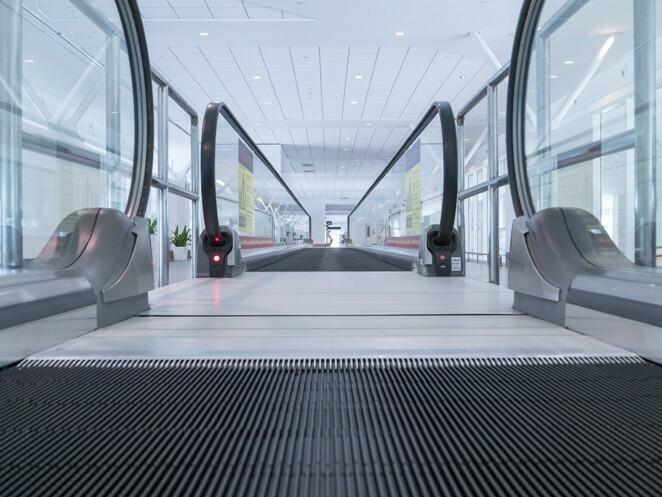 iwalk’s two different pallet widths – 1,100 millimetre and 1,400 millimetre – enhance passenger comfort while their reduced outer dimensions require less building space. iwalk boasts an eco-friendly design. The reduced total weight and stackable modules minimise transportation volumes and the related emissions. 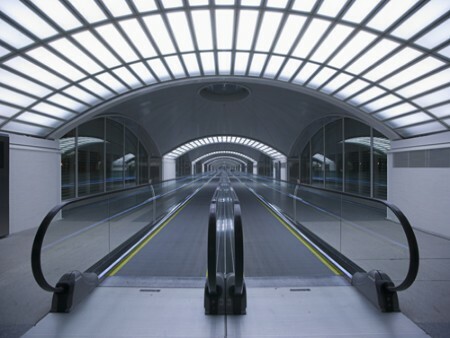 Energy-saving features such as its Energy Efficiency Controller and LED lighting enhance iwalk’s sustainability. So does the fact that, once this innovative product reaches the end of its service life, most of its parts can be recycled. State-of-the-art design entails more than just aesthetics. It also involves superb functionality. We’ve designed iwalk from the ground up to boost your project’s aesthetics while giving you the functionality you’ve only dreamed of. 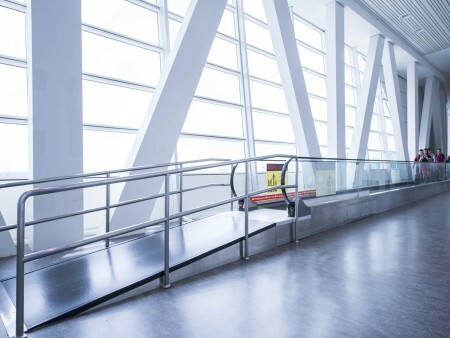 With its two-way flap system and additional skirt protector, iwalk’s unique handrail inlet stands up to the daily abuse of trolleys and carts. It eliminates unsightly brushes or rubbers and provides lasting good looks. Even better yet, a kick-resistant safety contact reduces stops, increasing iwalk’s availability. iwalk features two different balustrades: a slim glass version for a lighter, more sophisticated look and a robust decking option for a more solid impression. 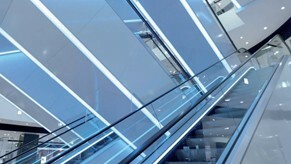 With several glass colours and LED lighting options, iwalk balustrades leave nothing to be desired. Located above the skirt band, LEDs in light-diffusing channels, the full range of RGB colours and different modes of operation create attractive effects throughout your installation. We provide black or silver pallets with the option of yellow demarcation lines. If you want something more extravagant, we’ll make sure you get that too. 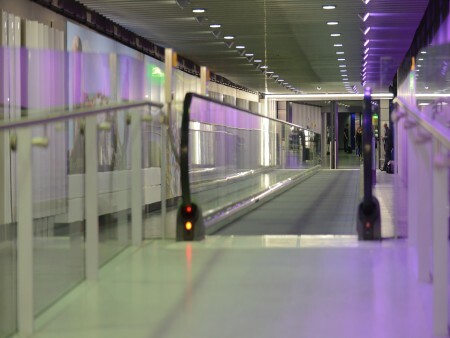 Optional blue or green pallet gap lighting ensures passenger safety and adds to iwalk’s visual appeal. A variety of patterns and colours for our durable combs and cover plates, in combination with accentuating comb segments, increases user safety while ensuring a distinctive look. 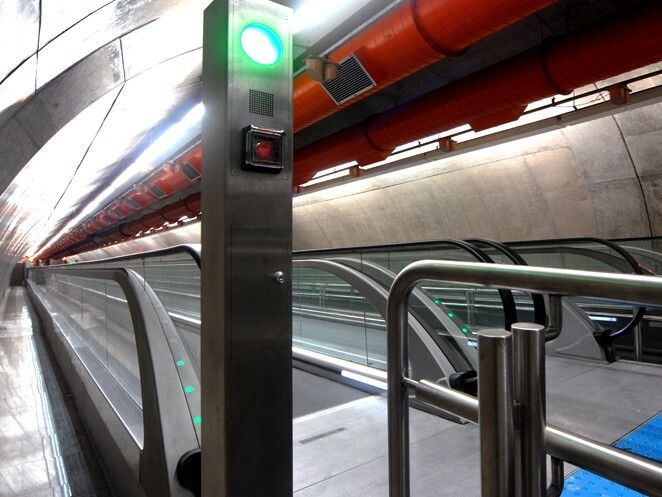 To create an even more unique ride experience, you can choose from additional features such as striking handrail colours and attractive traffic lighting placed in a column, the front skirt, decking or floor plate. iwalk’s inner and outer slim skirt design creates a spacious feeling and optimises the space used. 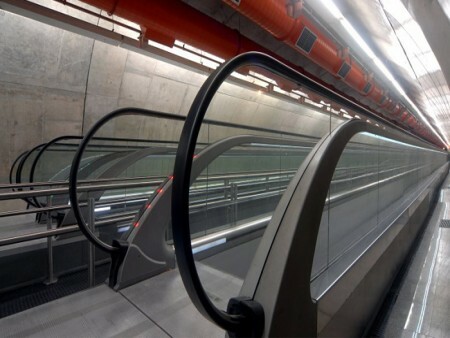 iwalk’s optimised glass-to-steel ratio creates a lighter appearance and increases recyclability. 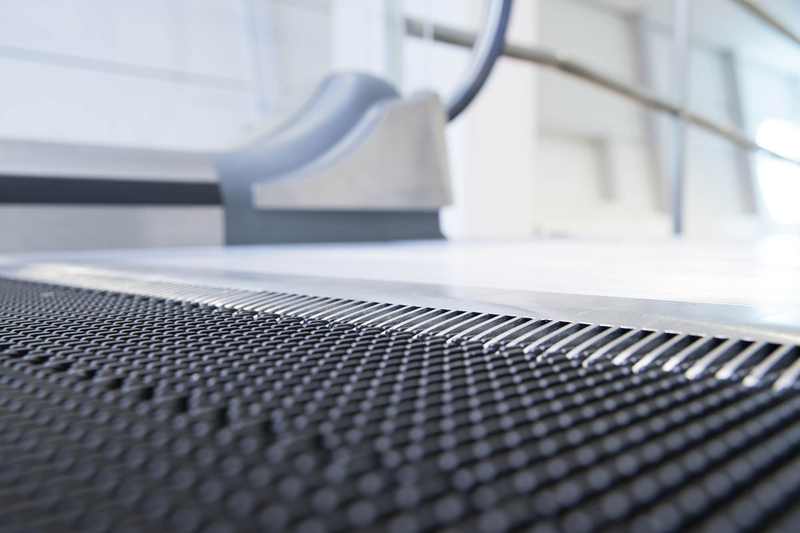 iwalk eliminates the need for visible fastening elements, providing a streamlined look and reducing the risk of hooking clothes or objects. iwalk is the result of extensive research and substantial customer input. Its next-generation modular approach addresses the limitations of conventional technologies, opening up new possibilities and enabling easier handling throughout the product lifecycle. iwalk’s stackable modules reduce the space needed for transportation. Now even plane shipments are possible. Its modules’ light weight and small size facilitate handling, eliminating the need for cranes – a forklift will do. Last-minute installations or relocations are now possible. 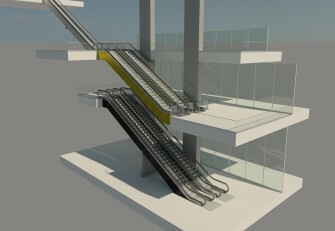 The modules can be transported by elevator while a smart connection system accelerates installation. 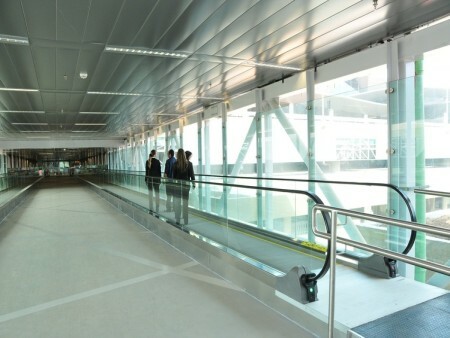 iwalk’s cold rolled profile combines the truss and guiding system, saving space by significantly trimming the truss’s height. Combining the truss and guiding system also decreases wear and tear on parts while increasing iwalk’s maintainability and durability. Guiding rollers connect the pallets, eliminating the need for a chain and lubrication. Better for both the environment and maintenance. The pallets’ guiding rollers cleanly engage with driving roller wheels at the main shaft to deliver a safe, smooth and quiet ride. iwalk’s advanced power transmission eliminates the need for lubrication thanks to the use of gearboxes in the drive system. Based on the ISO 25745-3 standard and depending on the configuration you choose, iwalk enables you to achieve the highest possible energy efficiency. As with any passenger mobility solution, proper handling and use are critical to ensuring a safe ride. We design our products with the user’s behaviour in mind to proactively prevent misuse. With over 50 safety features and options, iwalk keeps your passengers safe at all times. 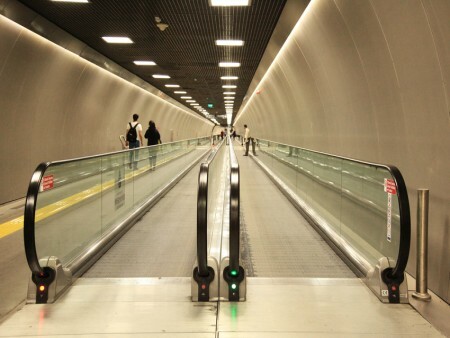 Entering and leaving a moving walk has never been easier or safer. iwalk’s new comb segments are only 7 millimetres above the pallet band – that’s 80% closer to the band than in conventional moving walks. This minimises the risk of stumbling. iwalk’s 12-millimetres-thick glass balustrade is some 20% stronger than conventional glass balustrades. This reduces the risk of breakage while providing a light appearance compared to heavier-looking balustrades. 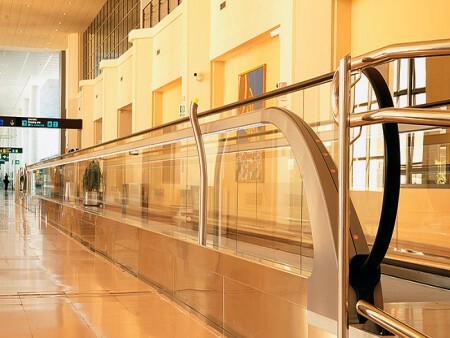 With an extended handrail at the entrance and exit, iwalk further enhances usability and safety, especially for the elderly and disabled.